Have you ever used a mirror? If you’re like most roadies, probably not. Mirrors are not for everyone, but I’ve been using a mirror every day for years, and I think a significant percentage of competitive cyclists would be grateful if they gave one a try. Bicycle mirrors come in many forms, but the two basic types are those that mount to your head via your helmet or glasses, and those that are connected somewhere on your bike. On my bikes, I use a sleek and aerodynamic bar end type that no one even notices. There is some disagreement about the usefulness of mirrors, but mostly I hear that from riders who have not even tried one, or who haven’t given it enough time. So I would suggest that if you fall into the majority of roadies who haven’t used one, try one out for yourself. I think for many, it’s going to be an eye-opening experience once it finally clicks. Using a mirror takes some getting used to, so I would suggest giving it a week or two before you decide whether they are for you. There are many examples of why mirrors make riding safer, but here are 5 reasons a mirror helps a competitive rider (whether you officially race or just race other riders you encounter on your route). Of course, you might fear that using a mirror means you are now entering Fred-dom, but fear not. If you win the ride, you are no Fred! 1. Three is not company: Roadies spend a lot of time training, and need easy miles as much as they need hard ones. So you are on a training riding with a friend, chatting away, and well before you would have heard the car approaching from the rear you see it in your mirror, call out ‘car back’ and you single up, allowing the vehicle to pass seamlessly before you regroup. 2. The Magic Gap: You are feeling good and want to push yourself with some hard efforts, but just before you get started a quick glance at your mirror lets you know a rider is bearing down on you. Since you are in the mood to mix it up and today is a hammer day, you slowly accelerate without giving away your increased effort, thereby continuously holding the rider at bay and leaving him bewildered and looking for a new coach. 3. Don’t Be a Gnome-Looker: You are overtaking another rider or group of riders. Of course, you give a friendly wave as you roll by. But now the race is on and you are the rabbit. Instead of continuously pretending to look with interest at the yard gnomes in front of the homes you pass in order to obtain information about your chaser(s), you simply glance at a small reflective surface and know exactly what advantage you have, and gauge your efforts accordingly. 4. Shark Attack: You are on a tough climb and the hammer is down. You get a gap on the group and hope you can hold them off until the top and gain all the glory. Of course, you are going hard, but because it is a climb you know not to dig too hard too soon. Doing so will mean blowing up and losing time. Knowing where the nearest chaser is will take energy and give away your concern. Then the sharks will smell blood in the water. Some climbs have switch-backs that provide a good view behind without ‘looking’ back, but this climb is not curvy. Having a mirror on board means one quick peek gives you all the info you need. 5. Cracking Eggs: The other rider you are exchanging pulls with is killing you. You are not sure how long you can take it. Every time he comes through he accelerates and it is starting to break you. Nevertheless, you match him pull for pull but also realize you can’t keep it up. But then you notice in the mirror that he takes longer and longer to get into your slipstream after you come around him and you see he too is suffering but not letting on. So now you know what to do. The next time you come through you give it everything you have and bam! He cracks. 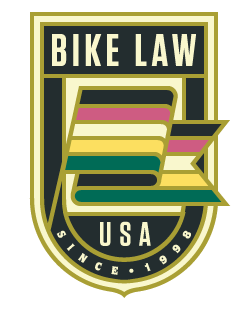 Bob Mionske is a former U.S. Olympic and pro cyclist, a nationally-known cycling lawyer based in Portland, Oregon, and affiliated with the Bike Lawnetwork. A prolific advocate for the rights of cyclists, Mionske authoredBicycling & the Law in 2007, and has continued his advocacy on behalf of the rights of cyclists with his Road Rights column in Bicycling magazine. This article, Why Roadies Should Train With A Mirror: 5 Tips for Competitive Riders, was originally publihed on Road ID Blog on May 20, 2014.